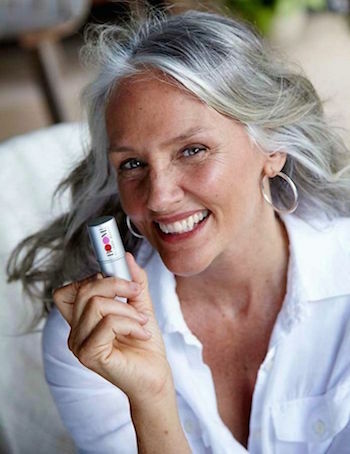 5 Hair Tips for Older Women Embracing Their Natural Color by 64 Year Old Makeup Artist Turned Super Model Cindy Joseph! 5 Tips For Embracing Your Natural Hair Color by Makeup Artist Turned Super Model Cindy Joseph! 1. Make it a party and celebrate! Be brave—celebrate your age and wear it proudly. Remember that taking joy in living is the most attractive thing about you. 4. Have fun with the transition: Go shopping for a new wardrobe flattering to your new color; get some great hats and scarves to ease the transition, or a fun wig! 5. Have fun with your roots: Cut your hair all the way down to the roots, wear them as a crown, or go to a hair dresser and discuss making your dyed hair match the natural color you’re growing in. Joseph let her hair go gray in her late 40s. Just like that, she was spotted on a New York sidewalk by a scout for the fashion photographer Steven Miesel. She’s been a model ever since, featured in ads for Target, L.L. Bean, Dolce & Gabbana, DKNY, Olay, Nivea and others. The line is not just for Boomers like Joseph. “Boom is the sound of a revolution in cosmetics,” she says. “Cosmetic companies are constantly adding products; I’m taking away. Mine is the only company that is pro-aging, not antiaging." Jennifer Aniston believes in aging gracefully and not over-doing it on the makeup. When asked by Self Magazine what is in her purse when she leaves for the day, she said, "Boomstick Color: It’s an all-in-one stain for eyes, cheeks and lips that’s so much fun." "There is this pressure in Hollywood to be ageless," said Aniston. "I also understand that age is kind of awesome… Don’t over-product—that’s the other thing." The products come in identical chubby white tubes that fit in the palm of your hand. There’s a sheer berry for cheeks, brow bone, eyes, lips, forehead and neck; a sheer iridescent champagne for the inner corner of the eye, cheekbones, shoulders, decollete; and an olive oil and beeswax moisturizer for lips, cuticles and around the eyes.They are $27 each and sold only on her website. After growing up in the Bay Area – Mission San Jose High School, Fremont, class of ’69 – she moved to Paris in the early ’80s and later to New York. Joseph married young, had two kids and began her makeup artist career in San Francisco in the late ’70s, working for Macy’s, Esprit de Corp and others. Try The Boom By Cindy Joseph Makeup Line! You’ll love it.